At the release of Oracle 11g Release 2 support was finally added for 4k sector storage devices. The storage industry has been trying to move away from 512 byte devices towards 4k for some years now, with the adoption of Advanced Format being increasingly commonplace. For more background on this, read my page on 4k sectors. Unfortunately, as is often the case, Oracle’s implementation of 4k wasn’t completed throughout the software. There is support in the places that matter, in other words ASM diskgroups and database redo logs, but these new features still cannot be used via the Oracle Universal Installer (OUI) or the Database Configuration Assistance (DBCA). If you are installing Grid Infrastructure and want to use 4k sectors, check out the various installation cookbooks which document the entire process. 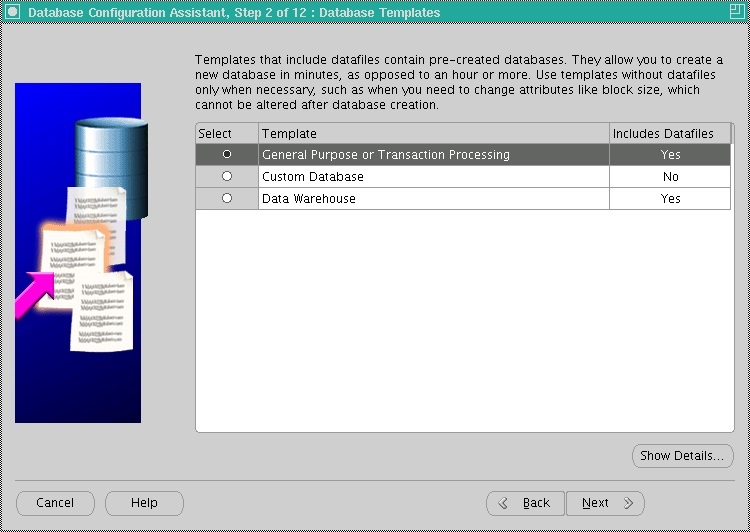 Once you have Grid Infrastructure installed, it’s time to install the database. In this example the Grid Infrastructure home is all setup, so now it is time to install the RDBMS home. I am going to do a software only install and then build the database manually so that I can setup the correct _disk_sector_size_override parameter in the spfile and create the redo logs as having a 4k blocksize. There is also an additional issue in that by default the OUI or DBCA automatic database build will put the spfile into ASM. However, there is a chicken-and-egg situation here because the ASM diskgroups are using a 4k sector size which means the database will not be able to read them without the _disk_sector_size_override parameter being set… and if the parameter is set in the spfile inside ASM then it can never be read. I have kept most of the defaults throughout the creation process – the only one I changed was the use of Automatic Memory Management, which for now I have disabled and gone with Manual Memory Management (because I don’t have the correct /dev/shm tmpfs filesystem in place – and because to be honest I still don’t trust it). 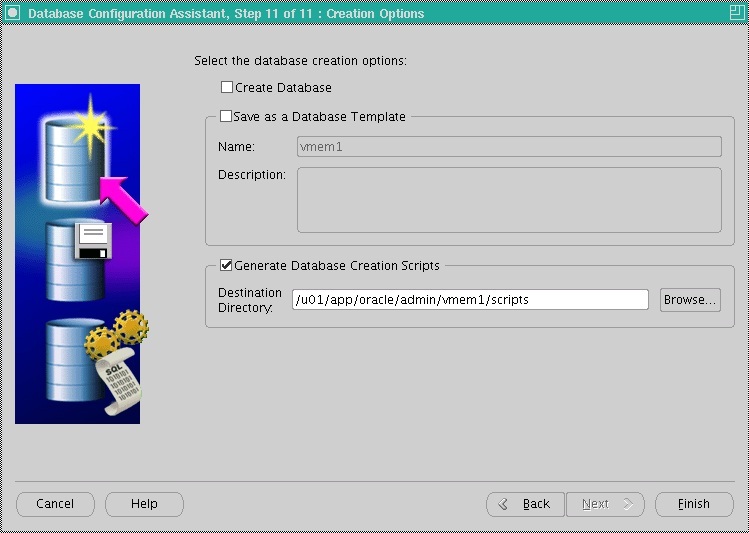 Create controlfile reuse set database "vmem1"
Now finally I need to edit the files postDBCreation.sql and vmem1.sql to change the location of the spfile, because this cannot reside in my ASM diskgroups if they have 4k sectors. host /u01/app/oracle/product/11.2.0/dbhome_1/bin/srvctl add database -d vmem1 -o /u01/app/oracle/product/11.2.0/dbhome_1 -p +DATA/vmem1/spfilevmem1.ora -n vmem1 -a "DATA,RECO"
host /u01/app/oracle/product/11.2.0/dbhome_1/bin/srvctl add database -d vmem1 -o /u01/app/oracle/product/11.2.0/dbhome_1 -p /u01/app/oracle/admin/vmem1/pfile/spfilevmem1.ora -n vmem1 -a "DATA,RECO"
Good article. Came in handy at the right time….Thanks. That is correct, but you’ll need the _disk_sector_size_override parameter set to TRUE in the init.ora files. Hi Sir, i have two node in cluster. Need i run ./vmem1.sh in all node ?
. For details refer to “(:CLSN00107:)” in “/u01/app/11.2.0/grid/log/rac2/agent/crsd/oraagent_oracle/oraagent_oracle.log”. I can’t really help you much right now because I’m walking the streets of Istanbul! What happen after to do this. Because Oracle RAC require spfile in diskgroup manage by clusterware . Let’s rewind a little. Why are you doing this in the first place? This is only necessary if you are trying to use 4k storage in 4kN native mode. Almost all Advanced Format storage has the option of 512e emulation mode, in which none of these SPFILE problems occur. Why not use that? First time , thank you for your help. In the my Lap, I had got install Oracle RAC with two node and use Microsoft iSCSI Software Target for virtual SAN , all node connect to SAN via iscsi. After I install gird and create ASM diskgroup success. I had got install database software to step create database, I had issue “I/O request size 512 is not a multiple of logical block size” . So i find your solution from google and do by your help . But in the my Lap using Oracle RAC not stand alone. Oh ok. So your choices are limited. Yiu either need to create some kind of 512 byte LUNs for a separate diskgroup which will store the SPFILEs, OCR and voting disks or you need to put them somewhere else, like on an OCFS volume. If the diskgroups you have now are using 4096 blocksize (you can check in v$asm_diskgroup) then you will not be able to store SPFILEs or voting disks in them. What are you trying to do? Are you using storage which is configured as 512e or 4kN? If your storage has the option to choose between 512e or 4kN you should choose the former, as the latter is a real pig to get working with Oracle. I’ve read that article. In my case nothing seems to work as described. I have 4kN Ultrastar HUC101818CS4204 disks attached to LSI 9380 MegaRAID SAS controlller which can ONLY represent them as 4kN LUNs. On top of Oracle EL7.3 I configured 11.2.0.4 or 12.1.0.2 ASM using ASMlib 2.0.8 as UEK kernel module. Until I installed 12.2 ASM and database. After that things seem to be working for now. I suspect that the reason why we have different results is that you used 512e LUNs for both 512e and 4kn tests.